Augmented reality, or AR, is an interactive display environment that combines virtual content with the real world. It adds various layers of digital information to the physical world such as videos, sounds and graphics. It is used for improving natural situations and offers perceptually enriched experiences. Although the term ‘augmented reality’ was coined in the 1990s by Tom Caudell, the technology has been in existence since the late 1960s when a Harvard professor, Ivan Sutherland, invented a head-mounted display called ‘the Sword of Damocles.’ Since then, this technology has witnessed numerous developments including the invention of the first augmented reality game by AR Quake in which the players had to wear a backpack carrying a computer and gyroscope. Nowadays, this technology finds applications in numerous fields such as gaming, military and healthcare. In the modern era, the global augmented reality gaming market has gained immense popularity with the introduction of Pokémon Go by Niantic and Nintendo in 2016. The game enabled the players to capture different Pokémon that appeared around them in the real world. Modern-day augmented reality games consist of a compass, GPRS, portable device and augmented reality card (AR card). 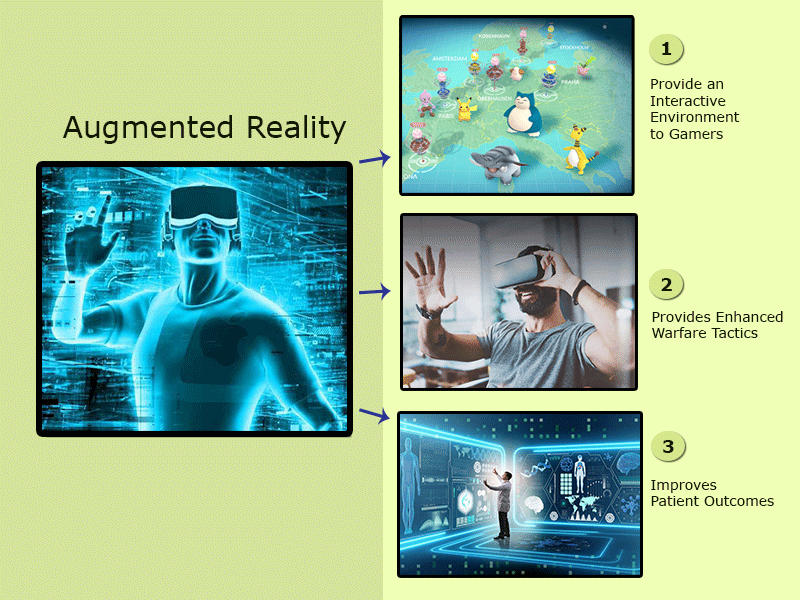 Nowadays, creators and developers in the industry are extensively utilizing the augmented reality technology on account of advances in computing power and technology. Over the next few years, the major players in the gaming industry are expected to concentrate their budget on embedding their products with the AR technology. The military has always been swift in utilizing advanced technologies for improving training and combat. With evolving technology, armies across the globe are using AR for augmenting their warfare techniques. There are three types of AR technologies that are being utilized in the sector including tactical augmented reality, HUD 3.0 and synthetic training environment. Amongst these, tactical AR comes with a heads-up display which shows crucial information, such as weapons targeting and spatial orientation data, on the pilot’s visor. This type of technology helps in improving battlefield awareness of soldiers, reducing the number of devices being carried and defeating the enemy more efficiently. On the other hand, HUD 3.0 is a helmet-mounted augmented reality display which aims toward improving navigation and training. Also known as Enhanced Night Vision Goggles, HUD 3.0 offers a better night sight and tactical information to soldiers. Lastly, synthetic training environment is an AR system that puts the soldiers into more mentally and physically stressing operational environments. This system enables the commanders to establish adaptive units with improved readiness. In the healthcare sector, augmented reality helps nurses and doctors in improving patient education and outcomes. The technology aids healthcare workers in learning about anatomy and the functioning of a body by enabling them to visualize and interact with the three-dimensional representations of bodies. Apart from this, AR is also proving to be beneficial as a tool for patient education. With AR-embedded systems, doctors can make the patients understand several surgical procedures and the functionality of different medicines. Augmented reality projects three-dimensional representations of the patient’s anatomy for the surgeons which helps them in improving the accuracy of procedures. At present, one of the most practical applications of AR in the field of healthcare is vein visualization which is used for marking the precise vein for injections. For instance, AccuVein, an imaging solution, provides a visual map of a patient’s veins on top of his skin. Over the next years, AR is expected to present a wide range of growth opportunities in the healthcare industry.